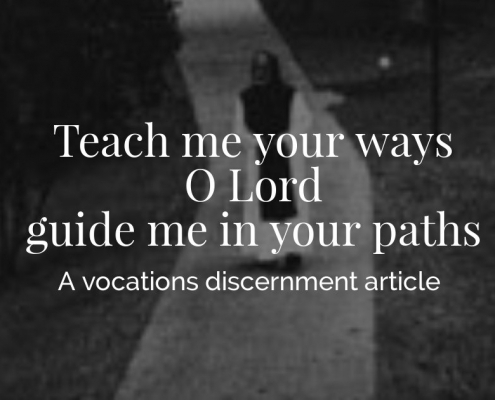 The attentive ear, receptive heart and open mind of a believer are essential to discover that God is calling someone to a particular path or vocation. God calls each of us by name in baptism. Each of us has a share in building up the church – weak and frail as our church may be at times. Faith places us in a dynamic relationship with God who is taking us where we have not yet been. And in the lives of God’s holy ones this may mean in a direction we might not yet have considered. When the Holy Father invited all the men and women who are novices preparing for vowed religious life to come to the mass he was offering at the Basilica of the Immaculate Conception in Washington, DC, Abbot Stan gave permission for our men in formation and me to travel to the capitol of our country and be present for this profound opportunity. Not wanting to stay at a hotel, a religious community with a house of studies, the LaSallette Fathers, were kind enough to provide us with accommodations. Leaving Mepkin at 4 AM, we arrived at the house of studies at 4 PM and received a warm welcome. It was when I walked into the living room that I was welcomed by five priests watching the Holy Father’s arrival at the airport on the television. A wonderful surprise was to be enthusiastically greeted by one of these five priests, who looked at me and said, “Father Kevin?” He had been an altar server in the the second parish where I had been assigned when I served as a parish priest. An excellent athlete, he progressed to representing the United States at the Olympics in his sport. A scholar as well as athlete, his life was rich and good and he met and became engaged to a wonderful woman. But the awareness came that God was inviting him to surrender those possibilities and he responded to a call to priesthood. And he now serves as the vocation director for his diocese. For the church to be strong we need faith-filled married people, faith-filled single people, faith-filled diocesan priests, faith-filled religious sisters and brothers generously fulfilling roles of apostolic service. The church also needs folks who are willing to come apart and live the call to contemplative monastic life. A discerner deliberately engages with God to learn where God may be inviting me to go. Let’s pray for those discerning their call. Michael Casey, OCSO, has been a monk of Tarrawarra Abbey, Australia, since 1960. After completing a degree in Scripture at Leuven, he received his doctorate from Melbourne College of Divinity for a study of desire for God in the writings of Bernard of Clairvaux. For the past decades he has been engaged in exploring different aspects of monastic spirituality, writing, and giving conferences throughout the English-speaking monastic world. His books include Strangers to the City and The Road to Eternal Life. Sister Manuela Scheiba, OSB is a member of the Abbey of Saint Gertrud at Alexanderdorf, Germany. (She entered when this was East Germany before the wall came down.) She teaches at the Monastic Institute at Sant’ Anselmo, Rome, Italy.